This lovely beef Ramen dish reminded me of two things. Firstly, there are still amazing recipes to try that will shoot straight into your top 20 and secondly, always buy the best you can afford. 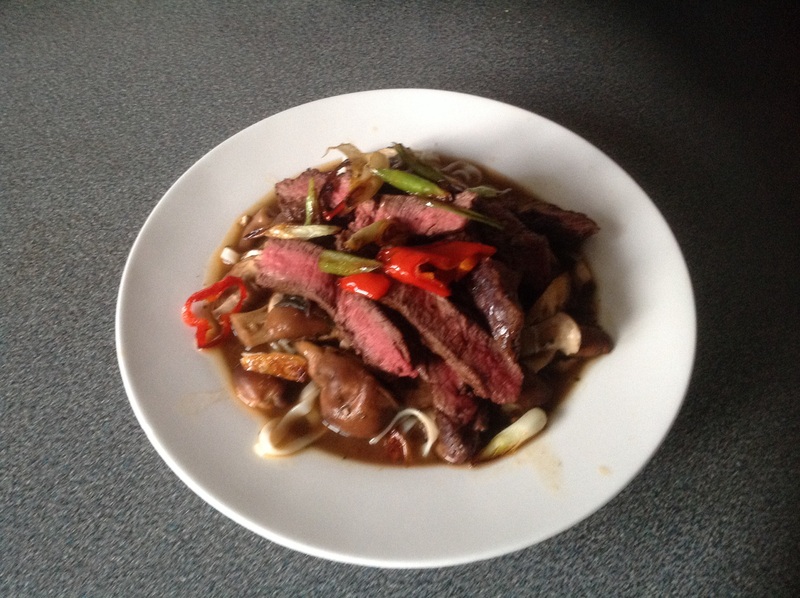 In this case I bought fillet steak and the end result was melt in your mouth beef accompanied by soft noodles in an incredibly beautiful spice infused broth. Overall a sensational combinations of taste explosions in your mouth that I was still savouring for some time afterwards. The broth is based on Miso, a traditional Japanese staple food and seasoning. There are two main types of Miso and its popularity varies dependant in where you are in Japan. The most common types are white miso traditionally consumed in the western part of Japan including Kyoto, while the eastern regions including Tokyo tend to prefer red miso. Miso is typically salty but its flavour and aroma depend on various factors such as ingredients, fermentation and the length of the ageing process. Other important variables that contribute to the flavour of a particular miso include temperature, duration of fermentation, salt content and the variety of koji. These different ingredients and variables result in miso which may be described as salty, sweet, earthy, fruity and savoury. You can find Miso soup in most large supermarkets in the UK. Miso paste is more difficult to find. For a great selection of both try the Clearspring on-line shop. Here is the recipe, a variation of the one I found in a Tesco magazine. Dissolve the Miso soup in 1 litre of freshly boiled water in a large pan. Add the ginger and star anise then leave to simmer over a low heat. Meanwhile cook the noodles as per packet instructions. Drain well. Heat a griddle pan over a high heat. Lightly oil the steaks and season well. When the pan is smoking, griddle them for 3 minutes on each side. Remove from the heat and allow to rest for 5 minutes then slice thinly. Add the mushrooms to the broth and continue to cook for 5 minutes. Heat a little oil to a clean pan and fry the chilli and spring onions until just turning brown. Divide the noodles between 4 bowls and ladle over the broth in equal measures. 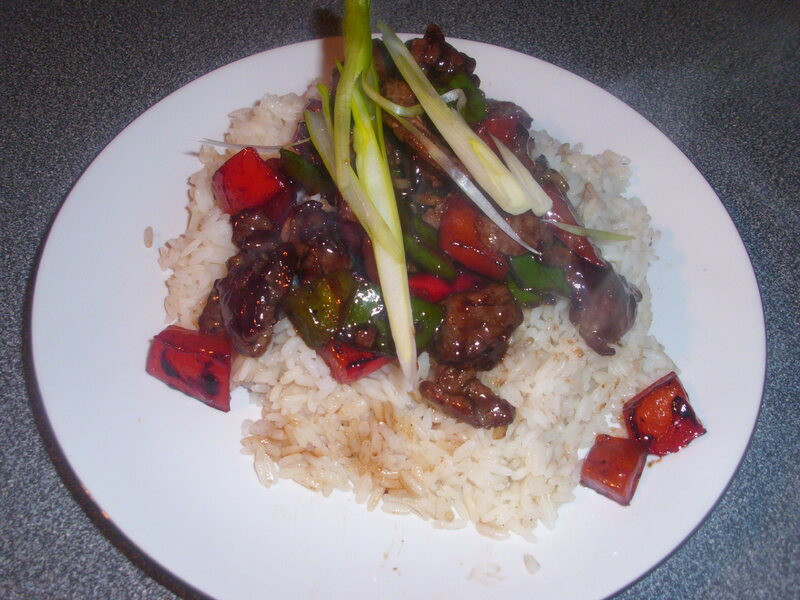 Lay the beef slices on top then scatter with the chilli and spring onions. garnish with the coriander and serve immediately. 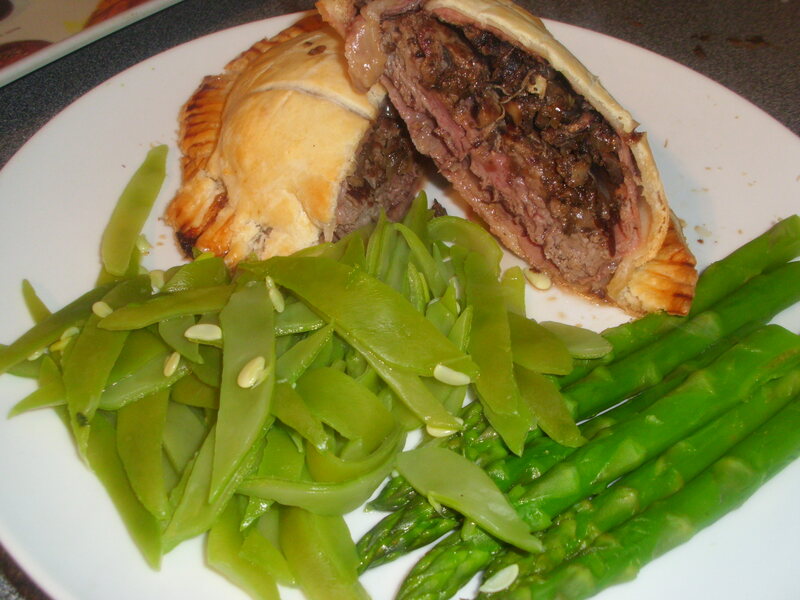 Individual Beef Wellingtons – delicious! I remember the first time we had a Beef Wellington. I loved it but my husband, who hates to eat meat that is too pink or bloody, had to have his flashed off in the frying pan. When I saw this recipe I could feel my mouth watering but I was quite nervous about what my husband would think of it. The steak is a fillet and it would have been criminal to overcook it so I decided to go with the recipe. Thankfully they turned out perfectly. The Parma Ham prevented the pastry from having a soggy bottom and added a lovely flavour to the finished dish. Fillet steak is obviously not cheap but it is well worth the money for such a beautiful dish. Perfect for a romantic meal for two or a dinner party for special friends. I served mine with green vegetables as I felt there was enough starch in the pastry for a rounded meal. There are theories that suggest that beef Wellington is named after Arthur Wellesley, 1st Duke of Wellington. Some theories go a step further and suggest this was due to his love of a dish of beef, truffles, mushrooms, Madeira wine, and pâté cooked in pastry, but there is a noted lack of evidence supporting this. In addition to the dearth of evidence attaching this dish to the famous Duke, the earliest recorded recipe to bear this name appeared in a 1966 cookbook. Other accounts simply credit the name to a patriotic chef wanting to give an English name to a variation on the French filet de bœuf en croûte during the Napoleonic Wars. Still another theory is that the dish is not named after the Duke himself, but rather that the finished joint was thought to resemble a Wellington boot, a brown shiny military boot named after the duke. 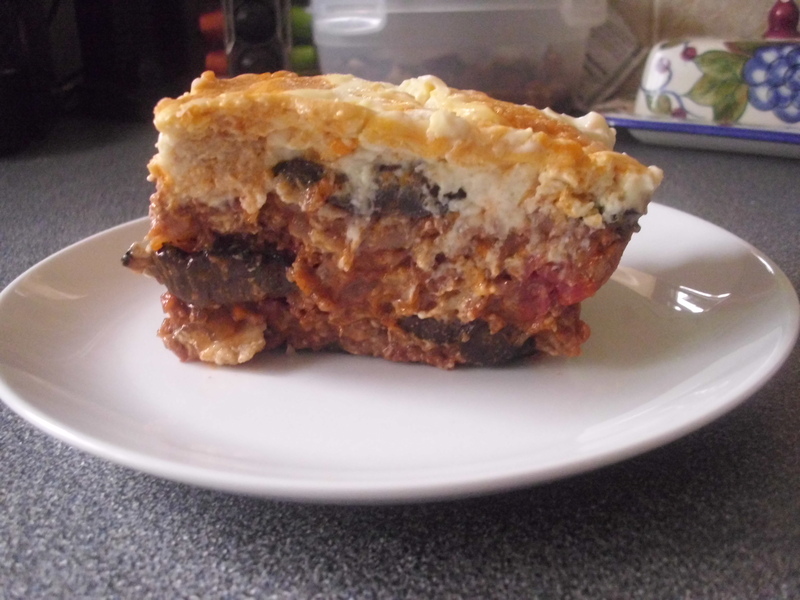 Beef Stifatho, a fantastic Greek casserole! I remember the first time I ate this dish. It was in Aegina, a small island not far from the Greek Mainland and the port of Piraeus. I was in the company of good friends, the wine flowed and I ended up singing with a group of four Greeks, none of whom spoke English. The owner of the restaurant, Costas, gave up at 2 am, brought us a final jug of Retsina, turned off all the lights and left us to it. What a great memory! Stifatho is a rich casserole of braised meat, and varies from one Greek island to another, and probably one household to another! Some prefer rabbit in the casserole but I prefer beef. It’s not that I don’t like rabbit but the tiny bones can be a bit fiddley. The recipe I love best is one I found in a book written by Pamela Westland, ‘A Taste of the Greek Islands’. If you ever get the chance to read it you will love it. Costas serves his Stefatho with Krithiraki, a rice shaped pasta, sometimes known as orzo. Whenever I have cooked this I do exactly the same. My kids love it and I never have to worry about leftovers. You can buy it in most large Supermarkets. The recipe is absolutely perfect for dinner parties, especially served with the krithiraki, as most people will never have had it and, those that have, will relish the memories it brings back of sun-kissed beaches, golden sunsets and friendly Greek people. It can be prepared ahead and reheats well, it can also be frozen. Perfect for busy people! First a bit about the island of Aegina. Aegina is part of the Saronic Islands, alongside Hydra, Spetses and Poros. It is a beautiful island, very fertile and green and full of pine and olive trees, pretty villages and lovely beaches. For those interested, there are also archaeological monuments, such as the Temple of Aphaia. Aegina is probably best known, however, for pistachio nuts. They have been grown on the island for as long as records existed and, today, you can buy them prepared in so many ways, roasted and salted in shells, packed into jars of local honey, covered in caramel to make a nut brittle and in their local nougat, just to name but a few. The island is only small and it is possible to see it all in one day if you hire a car. If ever I was tempted to live abroad it would be a tough decision as to whether to go to Aegina or Lardos in Rhodes. For now I am happy to visit all my friends as often as possible and recreate wonderful Greek dishes such as this one. Set the oven to 170C/150C fan/gas 3. Heat half the oil in a flameproof casserole and fry the meat over a high heat, stirring, until it is browned all over. Don’t overfill the pan or the beef will steam rather than sear. Do it in batches if necessary, depending on the size of the pan. Remove the meat with a slotted spoon and set aside. Heat the remaining oil and fry the onions over a medium heat, stirring, until lightly browned. Add the garlic and fry for a couple of minutes then add the tomato puree, vinegar, red wine and sugar. Return the meat to the pan and mix well. Put the cloves and cumin seeds either in a muslim cloth or a closed tea strainer. Add to the dish with the cinnamon stick and bay leaves. Season, cover and cook in oven for 1.5 hours. Blanch the shallots in boiling salted water for 1 minute. Add to the casserole and continue to cook for 1 hour. Check every now and again to ensure it is not going dry, if so, add a little water. When meat is tender, remove from oven. Remove spices and bay leaves. Stir in the lemon juice and sprinkle with the chopped parsley before serving. Cottage Pie! Comfort food at it’s best!! There are days when nostalgia takes over and you want to eat something great that you remember from your childhood. This is one of those days! The sunshine from yesterday has gone, replaced by dark clouds. Its time to eat something really comforting like Cottage Pie. I remember eating cottage pie at my Grandmothers on a Monday dinner time. Dinner time , in those days, was always 1300 hours. If you were a minute late your dinner would be in the dog!!!! She would have been a great sea captain! There is something fantastic about the smell of cottage pie as it cooks in the oven and the crunch as the spoon breaks through the crispy edges of the mashed potato to reveal the luscious beef mix below. Yum!!!!!!!! Grandma used to make hers using the beef left over from Sunday Lunch. There was never very much beef, not even on the Sunday, so she would mince it and pad it out with chopped up vegetables. I suppose it was one way of getting her Grandchildren to eat them. Whatever the agenda, I know that we all loved her pie. While we are talking of not wasting food, for tea we would eat dripping from the roast beef, spread onto warm toast and sprinkled with a little salt. Oh, the memories! There are all sorts of variations on the cottage pie. Shepherds pie is the most common, and is associated with minced lamb rather than beef. 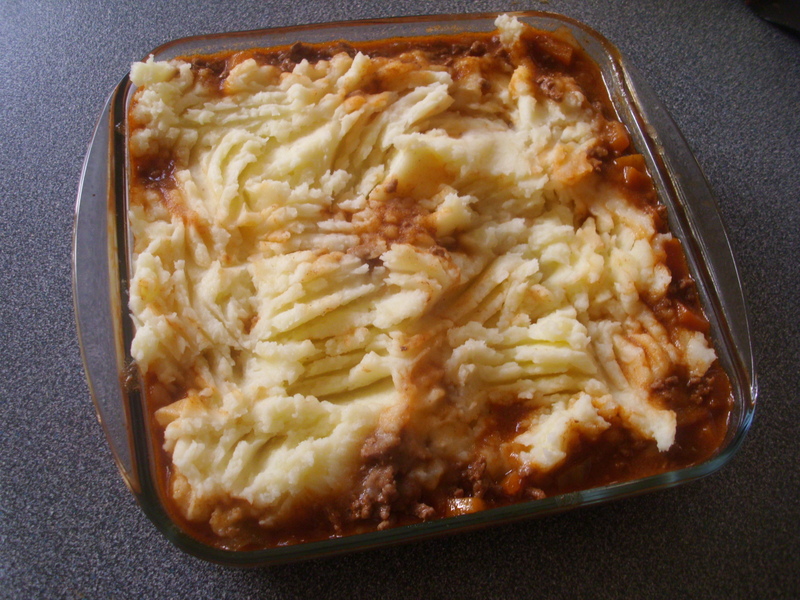 Cottage Pie was first recorded in 1791 when the potato was used by the poor. Cottage came from the work cottages they lived in. I’ve tried all sorts of Cottage Pie recipes. One included baked beans, some with cheese mixed into the potato topping, some tending towards an Italian version, using pancetta and red wine in the beef mix. All were really tasty and healthy too. My favourite though has to be my Grandmas version. I am serving it with boiled cabbage and gravy. Heaven! Heat the oil in a pan then add the onion, carrots and celery. Fry on a medium heat for about 10 minutes until the vegetables are starting to soften but are not coloured. Add the beef mince, crumbling to break up any large lumps. 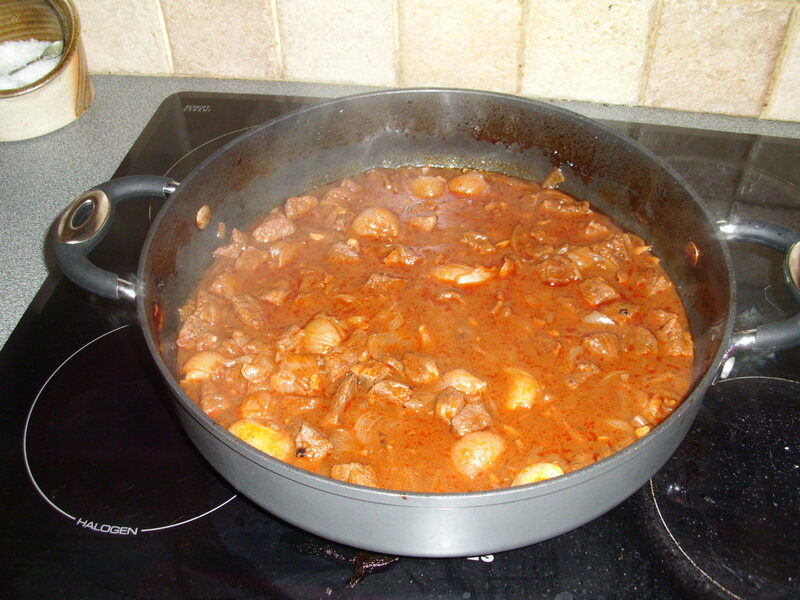 When browned, add the tomato puree and Worcestershire Sauce. Cook for a couple of minutes, stirring so it doesn’t catch on the bottom of the pan. Add the stock, mix well. Bring to the boil then simmer over a low heat for about 30 minutes. Meanwhile, make the mashed potato. Add the potatoes to salted boiling water, cover and simmer over low heat until potatoes are tender (about 15 minutes). Drain well then return to pan. Add the butter and milk and mash everything together until smooth. When the beef is ready tip into ovenproof dish. Top with the potato then bake in the oven for about 20 minutes or until the top is browned and the beef is bubbling around the edges. If you want to, you can freeze this at the end of Step 4. Make sure it is cold before you put it in the freezer. Defrost and continue with Step 5 when you want to eat it. There are certain dishes that will always be reminders of holidays in Greece and this is one of them. Moussaka is often referred to as the national dish of Greece but can often be oily so preparation is a key factor for a good moussaka. I made the mistake of cooking mine just before serving so the sauce was a bit runny, or maybe I just didn’t make it thick enough in the first place. Either way it did not impair the flavour as it was delicious and, when cold, looked the part as well. Some people add potatoes to Moussaka which does help the solidity of the finished dish but is definitely not a traditional ingredient. You can, however, use courgettes instead of aubergines if you wish. Aubergines are the most commonly used vegetable in Greece and the most versatile. They taste better if fried before adding to a dish but they do absorb a lot of oil so, if you are frying them, make sure you reduce the oil in the finished dish to compensate. They can also have a slightly bitter taste which has to be treated before cooking. There are two ways of doing this. the first way is to slice them then submerge the slices in salted water for at least half an hour. Rinse them well under cold running water, squeezing gently so that the slightly brown water runs away then drain them for at least half an hour and pat dry to prevent fat spitting during cooking. The second is to slice them and sprinkle with salt as I have done in this recipe. What is even more important is selection of aubergines. They should be shiny, firm and tight-skinned without any brown patches or scarring. 120 ml dry red wine. Lay the aubergine slices on kitchen paper and sprinkle with salt. Leave to sweat for 1/2 hour the rinse well under cold running water. drain and pat dry. Lay the aubergines in batches on a rack in a grill pan. Brush with olive il and grill for 4 minutes or until golden, turn over and repeat. set aside. To make the béchamel sauce, melt the butter in a large pan then add the flour. Mix well and cook for 30 seconds. Gradually add the milk either stirring or whisking all the time to prevent curdling. Heat gently, stirring continuously until the sauce is thick and bubbling. Remove from the heat and season to taste. Add the nutmeg. Cool slightly then beat in the egg yolks. Cover with a piece of greaseproof paper to prevent a skin from forming and set aside. To make the meat sauce, heat the olive oil in a large pan and saute the onion until softened. Add the minced meat and cook, stirring frequently for about 10 minutes until browned all over. Add the tomatoes, garlic and spices and season. Stir in the tomato puree and the red wine. Reduce the heat, cover and simmer gently for about 45 minutes. remove the cover for the last 15 minutes to allow all the moisture to evaporate. Set aside and cool slightly. Sprinkle the bottom of a large ovenproof dish with the breadcrumbs. Arrange a layer of aubergine on top followed by a layer of the meat mixture. Continue layering like this, finishing with a layer of aubergine.Carefully pour the sauce over the top and spread evenly. Sprinkle with some grated cheddar cheese and bake in the oven for 1 hour or until the top is golden brown and the moussaka is heated through. Serve warm. Cornish Pasties – absolutely scrummy! I have always loved meat in pastry, be it pies, puddings or pasties. I know it is not the healthiest of food but it is comfort food at its best. It also brings back fond memories of my childhood as my Grandma was a great pie maker, both sweet and savoury, and I would always make sure I had a place at her table when I knew she was making one. 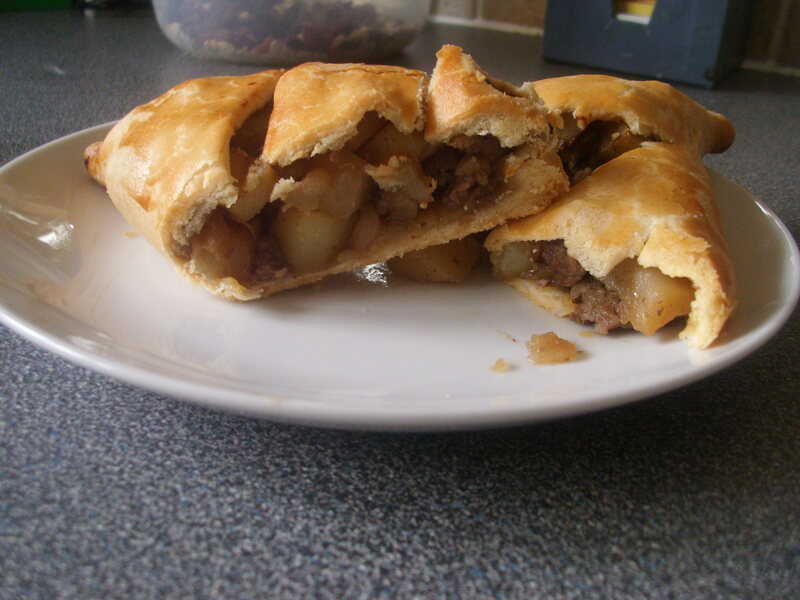 I have tried making Cornish Pasties before but have not had a lot of success. This recipe is really easy though with a few shortcuts, like using ready-made pastry. Originally the Cornish Pasty was a sort of fast food for miners, fishermen, farmers and children to take to work and school. The pastry would keep the filling warm until lunchtime. the filling would depend on the wealth of the family. The less wealthy families might omit the meat and just use the swede, potato and onion as filling. Others might use the left over meats such as boiled ham. Cornish Pasties seem to be making a comeback in popularity. There is a chain of bakeries all over the UK now that sell them, hot and inviting. The fillings may be far from traditional on occasion but there is no doubt that they are exceedingly good. We recently had one during our visit to Cambridge and my husband thought it was the best he had tasted until he tried these. The recipe makes four medium-sized Pasties. I am sure they could be frozen before cooking if you want but don’t bank on freezing any after cooking as the smell and the taste will make them disappear like magic. 500g chilled ready-made shortcrust pastry. Heat half the oil in a large, heavy based frying pan and cook the onions for 5 minutes over a low to medium heat until softened but not coloured. Remove and set aside. Add the remaining oil and add the meat. Cook over a high heat for 3 – 4 minutes until browned all over. Add to the onions. Add the stock and Worcestershire sauce and boil rapidly until it reduces to about 2-3 tablespoons. Return the meat and onion to the pan and coat in the gravy. Simmer until there is no excess gravy visible. In the meantime, cook the potatoes and swede in two separate pans of boiling salted water until just tender. Drain and add to the meat. Allow to cool. Roll out the pastry until it is about the width of a pound coin. Using a tea plate as a template, cut out 6 circles. Spoon the mixture into the middle of each. Egg wash the edges and bring them together. Crimp to seal. Chill for 30 minutes. Make two or three slashes in the top of each pasty to allow the air to escape. Brush with egg wash then bake for 20 minutes in an oven preheated to 200C/190C fan/gas 6 then turn down the oven to 180C/170C fan/gas 4 and bake for a further 20 minutes.